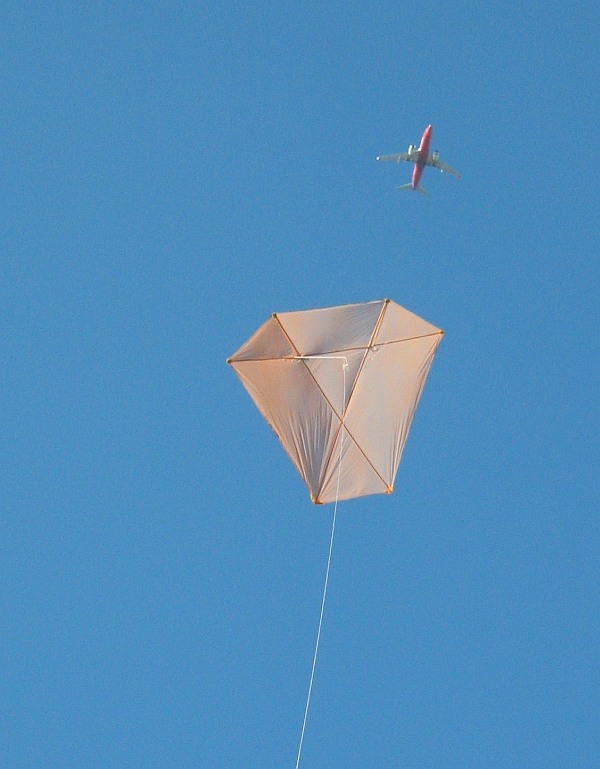 This set of instructions on how to make a Barn Door kite assumes you know absolutely nothing about kite making. You might already have some of the simple tools and materials required. The Dowel Barn Door is a fairly large tail-less design based on the traditional American kite. However, it will still fit into nearly all road vehicles, ready to fly. Either just in front of the rear seat, or flat in the trunk (boot). 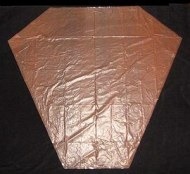 This kite is good in light to moderate winds, and easily copes with gusty inland air. If the breeze strength is a bit too much for the Dowel Diamond or Rokkaku, it's time to pull out the Barn Door. Setting up on the flying field is just a matter of attaching the bow-line toggle to put some curve into the horizontal spar. Then the flying line is attached to the bridle. At this point you are ready to launch! The method of attachment is illustrated further down this page. When you have successfully made and flown the Dowel Diamond, move up to this Barn Door for more of a challenge! 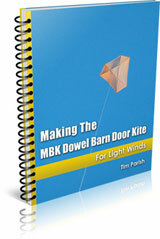 Making The MBK Dowel Barn Door Kite is a handy e-book of printable step-by-step instructions. It's a PDF file download. Now's the time to read up on the kite making tools and materials required for making a Dowel Barn Door, if you haven't already. 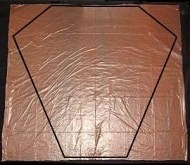 Firstly, take a large bag that will fit the entire Template shape within one side, and lay it flat on the floor. With scissors, cut along all the black lines. 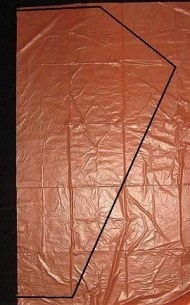 This will leave most of the width of the sticking tape inside the sail outline.